Why Choose Amadget Test Leads Set? Amadget 14 in 1 professional electronic test leads set, with CAT-1000 safety rating, can be safely and widely used for school laboratory factory and other general purpose measurements. Compatible with virtually any meter equipped with shrouded banana input jackets, this kit's interchangeable probe tips, mini-hooks and alligator clips provide a connection method to meet most electronic testing needs. 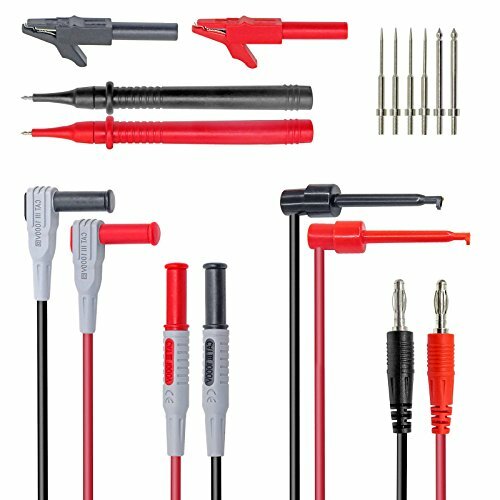 【WHAT YOU GET】- Amadget 14 in 1 Electronic Test Leads set, 2 x Meter Leads, 2 x multimeter leads with hook, 2 x alligator clips, 2 x test probes, 6 x replaceable tips. 【TEST VERSATILITY】- Set includes 6 replaceable probe tips for different electrical work and multi-use. 2 PCs 2mm standard Tips for general purpose measurements, other 4 PCs 0.3mm altra sharp tips make it accurate and easy to get at small contact points on high-density boards. 【USER-FRIENDLY】- Made with silicone and ABS + PA materials insulation, rated to CAT III 1000V, the test leads are more secure, durable, flexible and easy to handle when testing equipment. 【ALLIGATOR CLIPS】- Two mini alligator clips with removable insulators can connect to 4mm banana plug, durable quality, the maximum size of the opening: 12mm. 【PROTECTIVE COVER】- The plug of the wire are equipped with protective cover to prevent damage to the test lead plug. If you have any questions about this product by Amadget, contact us by completing and submitting the form below. If you are looking for a specif part number, please include it with your message.